The Short Mystery Fiction Society is a worldwide group of writers, editors, publishers and readers. Through informative discussions, publicity efforts, and annual awards, we promote the creation, publication, and appreciation of short crime and mystery fiction. Subscribe to the free Shortmystery Yahoo! Group. Send an e-mail to Shortmystery-subscribe@yahoogroups.com or visit the Shortmystery subscription page. The current front page descriptions of the Derringer Awards and officers' roles will be shifted to the "Awards" and "Officers" pages respectively. The more informal description of the group will be on a new "Members' Welcome" page. The Short Mystery Fiction Society includes wonderful and friendly people across the USA and Canada, the UK, India, South America, Australia and other exotic lands. SMFS members engage in daily discussions about short mystery and crime fiction in particular and fiction writing in general. Ask questions about crime scene technology, police procedures, how PIs really operate, the best way to poison someone, how long does a dead body stay warm, or any other genre-related topic. You'll get answers from qualified experts in the field or from fellow SMFSers who have researched and written about it. Have a problem with a story you're working on? Not sure how to develop a plot, plant clues and red herrings, add substance and life to your characters? Ask and you'll get help from others who struggle through the same problems with every story they write, whether it's their first or their hundred and first. Members of SMFS also share information about where the best stories can be found for your reading pleasure, as well as where and how to submit your own stories for publication in this ever-evolving marketplace. By a margin of 58-20 votes, the proposed new layout is adopted. By a margin of 56-28 votes, the Web archive is made private. By a margin of 73-14 votes, the Golden Derringer is renamed the Edward D. Hoch Memorial Golden Derringer. Q: I'm receiving email from a group, but when I try to visit the group's webpages, it says that I "need to enable web access". Q: I get Group email, but I’m not in the Member list and I don’t see the Group when I sign into groups.yahoo.com -- what’s up? Your account may be "bouncing". Yahoo! Groups delivery may be delayed or the site may be down. Visit the Official Yahoo! Groups Blog for the most current information. First, check your Shortmystery membership page. Click on the pencil icon next to "Identity". If your desired email address is listed, click on its option button. Then click on the purple "Save" bar to register the change. 1. Move your mouse pointer over your name in the top right corner of the page. A menu should appear. Click on "Account Info". 2. From your main account page, click on the "Account Security" tab in the left sidebar. 3. Click on "Email Addresses". A pop-up window should appear. Click on "Add recovery email address." 4. Enter your desired email address and click on the blue bar to send yourself a verification email. 5. Once you've verified the new address, you should be able to select it from your Shortmystery membership page under "Identity". You can also use the Edit Groups page to set any of your other Yahoo! Groups to deliver to the new address. The SMFS today received permission from Edward D. Hoch's wife Patricia to rename its Golden Derringer Award for Lifetime Achievement in Short Mystery Fiction "The Edward D. Hoch Golden Derringer." SMFS members are voting on this issue. When posting, avoid irrelevant quoting (e.g. entire messages or digests) and long signature files. These are wastes of network bandwidth, causing slower dowloads. Trimming a post (or, more often, a reply) is deleting anything extraneous to the point you are trying to make with your message. When you create a reply with most e-mail software, the message you are replying to is often automatically quoted. If you are not replying to everything in an original message, there is no need to quote the entire message. You can delete the parts you're not addressing. Trimming also applies to the signature lines or ads added by many ad-supported e-mail services (Yahoo!, Hotmail, Netzero). My opinion on trimming posts is similar to mine on congrats and thanks. It makes no difference whether a post is individual or digest; trimming a post shows I take more care with it, like taking the "trouble" to send private congrats. It shows I don't want to bother others with anything irrelevant to my post. I wouldn't include anything irrelevant if I were giving a speech or writing a letter. I give e-mail the same attention. The reason I direct people to send their questions of list policy and personal disputes offlist is I can often answer them without inconveniencing the members who don't want to see the list bogged down in policy. I bring matters to the list's attention when I believe members' input will be valuable or the issue is important enough that members should be made aware. If I may inject an opinion on congrats and thanks, I don't see how public congrats and thanks are better than private congrats and thanks. Public congrats makes sense if the one congratulated was too shy to mention his accomplishment himself onlist, but otherwise congrats can come off as the congratulator trying to score appearance points. Likewise public thanks make sense if the thanker has no other means of communicating with the congratulator, but otherwise it can be done just as well offlist. The way I see it—more opinion—if one were really sincere in wanting to congratulate another, the congratulator wouldn't mind the "trouble" of a private message. Onlist congrats can have the feeling of piggybacking and can be pretty hollow, and a cookie-cutter congratulations most often elicits a cookie-cutter thanks. As a congratulator, when searching the list for publication announcements also check whether an announcement has already received congrats. If so, please send your congrats privately. You will occasionally see the term "moderated status" onlist. When on moderated status, a member's posts are subject to moderator approval before they reach the list. People first joining Shortmystery begin on moderated status until a moderator determines they are actually interested in Shortmystery and not simply spammers. Moderated status is also applied if a member's posts devolve from reasoned argument to impulsive reaction (insults, etc. ), or if any spam is sent from a member's account. Regular posting status is restored when the member returns to reasoned argument or the member's account proves to be spam-free. Under Review: Should list archives be made private? The Shortmystery message archive is currently readable by non-member visitors to the Yahoo! Groups site. Should we make the archive private so only members can read the messages by signing in? A group vote on this is forthcoming. The official time as relates to all list deadlines and events is U.S. Eastern. This will be specified on all time-sensitive announcements. SMFS membership is currently discussing proposed rephrasing of its statement of purpose. To prepare for the onlist discussion, read the existing statement and the proposed rephrased statement. Onlist discussion of the proposal runs through July 14, with a group vote July 15-29. Below is a copy of the SMFS's existing statement of purpose at http://www.shortmystery.net. It is currently under review by the members along with a proposed, reworded statement. A group vote on which statement to adopt will take place July 15, 2008. The Short Mystery Fiction Society seeks to actively recognize writers and readers who promote and support the creative artform of short mysteries in the press, in other mystery organizations, and through awards. The Short Mystery Fiction Society is an email list group of writers, readers, fans, editors and publishers of mystery and crime fiction from all around the globe. Membership includes wonderful and friendly people across the USA and Canada, the UK, India, South America, Australia and other exotic lands. SMFS members engage in daily discussions about short mystery and crime fiction in particular and fiction writing in general. Ask questions about crime scene technology, police procedures, how PIs really operate, the best way to poison someone, how long does a dead body stay warm, or any other genre-related topic. You'll get answers from qualified experts in the field or from fellow SMFsters who have researched and written about it. You'll also participate in choosing the best mystery stories published each year. The annual Derringer Awards were created by the Short Mystery Fiction Society in 1997 to honor excellence in the field of short mystery fiction. The name "Derringer," after the palm-sized handgun, was chosen as a metaphor for a mystery or crime short story-small, but deadly. 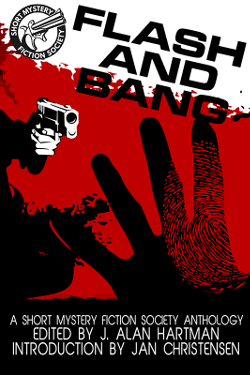 Any mystery or crime story published in a professional print or electronic magazine or book length anthology is eligible for a Derringer. The author does not have to be a member of SMFS to be considered. Winners in each category are chosen by SMFS member vote. SMFS has two officers, elected every two years through a nomination and voting process by members. Or simply visit our discussion list web page. Then, sit back, relax and join in. There are no membership dues, no dumb questions and no wrong opinions. It's all about sharing a common interest in mystery and crime fiction with friends.